Each year around August or September SANParks holds their annual game counts. 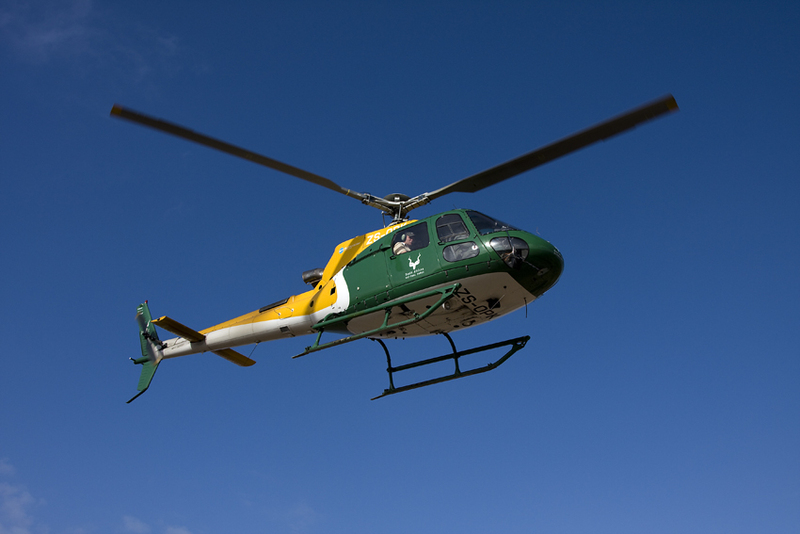 It is an areal census, which they do from both a helicopter and a fixed-wing airplane. They count elephant, buffalo and rhino populations amongst other things. And there is a different census for the rare antelope: Sable, Roan, Tsessebe, Lichtenstein’s Hartebeest and Eland. Steven often gets asked to help out with the helicopter counts. Probably because he does not get nauseous during the choppers erratic movements. I was spending 5 weeks with Steven in Letaba when they asked him to help out again and he managed to get me a spot on the rare antelope counts too!! I felt like a kid in a candy store! They would come and fetch Steven with the helicopter from the helipad in Letaba and they would count between here and Shingwedzi. Then I was going to drive to Shingwedzi in Stevens car and join the counting team the next day. We would count north of Shingwedzi all the way to Punda Maria. I had never been to Punda and the whole expedition was like a dream come true for me! Slightly concerned I stocked up on some airsickness tablets for just in case. I was not going to ruin Stevens good name and soil the helicopter! Besides, they make you clean up after yourself if you do get sick, which was even more of a motivation to keep all my food down! With a car packed with our overnight bags, some provisions, and camera equipment, I took Steven to the helipad at the living quarters close to camp. It was extremely exciting to see the helicopter land; it came in so quickly! The wash of the rotors sandblasted us as it touched down. Steven was such a gentleman shielding me with his coat, both with our backs turned towards the wind. As the engine shut down I had a nice look at the ‘squirrel’. It was painted in the SANParks colors, green, yellow and white. My aviation heart skipped a beat. I could not believe I was so lucky to get to spend the next two days on board this amazing machine! Being on board our old KLM Boeings seemed very boring all of a sudden! After a quick refuel, the team was ready to go again and I kissed Steven goodbye. The rotors were gaining momentum and the sound of the engine grew louder and louder until the squirrel finally lifted off the ground. I could see Steven wink at me. Man, he was gorgeous! The helicopter hovered in place for a few moments and then rose up into the air. With its nose tilted slightly down, they took off north towards the counting area for the day. As I waved goodbye at them, I started to get the feeling that life with Steven was going to be far from boring! My drive to Shingwedzi was far from boring too! I had an amazing leopard sighting just south of Mopani and spent a good half an hour in the middle of a buffalo herd that was crossing the road. Parking my car, switching off the engine and sitting with the buffalo is probably one of my favorite things to do when I have the time. Watching them watch me, looking over their noses like I owe them money or something, is extremely entertaining. I got to Shingwedzi with some time to spare. After exploring the camp and the surrounding area a bit I asked for directions to the research camp, where we would be staying the next few nights. I got there just as I could hear the helicopter come in to land. Steven climbed out of the chopper with a big smile on his face. He had had an amazing day! They flew Lanner Gorge, had seen bush pigs and lions! Only they had to stop once because one of the team members had vomited. Oh dear. So even seasoned counters on the helicopter have airsickness moments… I was secretly quite relieved I had bought my tablets! The next day it was our turn to count. We left for the helipad early. I had butterflies in my stomach (and an airsickness tablet, you know, for just in case). While the pilot performed his pre-flight checks, I got a briefing about the census. About the pattern we were going to fly and the areas, about counting a hundred meters to my side of the helicopter and to try count and photograph males, females and youngsters. I was also to call out any raptor nests I saw. Steven squeezed my hand as the engine came to life. “Have fun my babe!” I heard him say through my headset and he winked at me. Beaming at Steven I gave him a big thumbs up. I have always loved the feeling of an aircraft taking off. The feeling in a helicopter is different but just as exciting. Before I knew it, we were airborne and on our way to the area north of Shingwedzi where we were going to count the rare antelope. Kruger National Park is already beautiful seen from the road and the viewpoints. But you only really get a sense of its vastness from the air. As far as the eye could see all around us was unspoiled wilderness. It made me feel so small and so fortunate at the same time to be able to experience Kruger like this! We flew over a beautiful area with koppies and dry riverbeds, past Babalala picnic spot where we saw a dead hippo in a wallow. Steven had told me that the northern part of Kruger had been dealing with an anthrax outbreak, and the hippo looked like a recent victim of this terrible disease. It took us a while to get to our counting area and even though I was having the best time ever, I somehow could feel my eyelids getting heavy. I shook my head to try and stay awake. Why on earth was I getting sleepy during a helicopter flip over the park? My bag was at my feet and I scratched around to find the airsickness tablets I had bought from the pharmacy in Phalaborwa. “ Can cause drowsiness – do not operate heavy machinery” or something similar was written on the back of the box. My goodness, I had not seen that when I bought it, I was too worried about throwing up…! Are you freaking kidding me? Did I seriously buy tablets that were making me sleepy? During my best time in the park ever? No way! I gave the box to Steven who had a good laugh at my expense when he read what was written on the back. He kindly gave me his red bull. That helped, but I was extremely embarrassed at my silly mistake. The counting takes place in a grid pattern. At the end of each line, the helicopter makes a sharp 180-degree turn to the next line parallel to the previous one. Then when we spotted a herd of our rare antelope, the pilot would circle back and around so we could count, identify the number of males and females and for me to take pictures. I can honestly say that I did not expect the G forces of the movements of the helicopter in those turns. It is nothing like being in an aircraft and I was extremely relieved I had my airsickness tablets, drowsy making and all. Because I was still getting a bit queasy. Before I knew it, we had come to the end of the grid and were heading to Punda Maria to refuel. My first time in Punda Maria and I arrived in a helicopter. How amazing is that! I fell in love with the stunning scenery of the far north; flying over vast open areas with countless baobab trees, past amazing koppies and rocky ridges, it was all incredibly beautiful. When we touched down, I made Steven promise me to take me back to Punda one day so we could explore the area at ease. We had a quick bite to eat in the restaurant and then set off in the helicopter again to count a different area. And then two more areas the next day. We did not only see rare antelope while we were up in the air, but we saw elephants, a honey badger and a big herd of buffalo too. Their hooves hammering the dry soil as they ran sent a huge dust cloud up in the air. I loved every second of being up there. All too soon our two days with the counting team were over and we were on our way back to Shingwedzi. It had been a successful few days with good and healthy looking antelope populations. So the mood was happy and cheerful as we came closer to camp. The pilot had put the theme song of the movie Top Gun on over the radio. He dove down to fly the last stretch low over the dry Shingwedzi River. It felt like I was part of a movie. The riverbank was zooming past almost at eye level, music blaring in my ears. It was a few moments I will never forget! Until the pilot climbed up steeply and turned just before the high water bridge and I almost, but just almost, lost my lunch! Lucky you! I once took part in a hippo count over Blyde river in an Air Force Allouette thanks to my good friend Wynand Uys’ connections. Despite being famously immune to motion sickness I almost embarrassed myself when we first took off! (code green!) We will be in Letaba from the fourth to eleventh of August and will keep an eye out for you when in camp. Although I can appreciate that you can’t meet all your followers it would be great to say hi if we happen to run into you! Hi Gerlof! Oh wow I am sure the Blyde is amazing from up in the air too! Would love to see it one day! Thank you so very much for taking the time to document this amazing experience, I have been fortunate enough to spend time at Punda Maria. Lovely part of the park and well worth the visit. Thank you again, looking forwarded to your next blog. Hi Helen! Wow dating a helicopter pilot must have been very interesting! I have only been on a chopper on two other occasions; once going around the Cape Peninsula and once flying from Nice to Monaco in the south of France. I loved it! I think I will come back as a helicopter pilot in my next life! Ah don’t you hate it when that happens? the bottom of a brown paper bag is far less interesting than a rhino on the runway! ;-))) Thanks for sharing your experience with me! The northern part of the Kruger is my best part, not saying I don’t like any other part but their is an air of serenity and mystery about the north. Crook Corner, the Fever Tree Forest and the magnificent Baobabs are just WOW! And then of course there are the unusual animals, Roan, Eland etc. I just love reading your blogs, with a hint of jealously only because I can’t spend that amount of time in the Best Place on Earth. Hi Noel, thank you so much for your lovely comment! Yes, I agree with you, the far north has something quite amazing. I also like it because it is not as busy as the south of Kruger. Baobabs are my favorite trees and you are right, they are fabulous up there! I was fortunate to go to the Okavango on two long business trips with a major safari company in 2007 and 2008. One of the most memorable parts was a relatively short, but very interesting transfer in a helicopter. I also did quite a number of helicopter trips in the Zambezi valley and along the Zambezi (I was working – in the regular army 1968!). Saw the most amazing, massive crocs and huge, really huge, herds of buffalo among other beasts. You are so very lucky to have experienced even a part of KNP from a helicopter – I do envy you that! Love your conversational blogs – keep em up! Wonderful description of your helicopter flight , thanks Linda. I’m so envious; it must have been amazing! I saw someone’s pics of Kruger from a fixed-wing once, and I agree, its only then that you really get to grips with the sheer and awesome size of the place and how much wilderness area there is. I hope that you have since managed to get to Punda to enjoy a bit of time there and see some great birds. Hi Sal! Yes we spent a good few days up there after the counts. What a magical place. Steven brought me on this one dirt road- I cannot remember which one. But we came around a bend and this amazing vista opened up before my eyes. With baobab trees everywhere, rocky outcrops, it was so beautiful it brought tears to my eyes! One of my favorite spots was the bridge over the luvuvu, the canopy of the trees making the road look like a tunnel. We should really got back there again! Happy memories! Sounds absolutely stunning, sigh. The furthest north I have been is Shingwedzi many years ago; would so love to get up to Punda but I don’t think it will be possible as we stay in Mopani and its a bit far. But actually we always have such a good time in the park I only think about it when I’m at home like now! I LOVED this story. I am crazy about flying and any flying time counts as some of my favourite experiences in my life. I am so jealous of this experience I cannot even explain how much. Haha. I hope that in the meantime Steven has taken you to explore the Punda Maria area? Haha Yes he has! We spent some amazing time up there exploring. Would love to go back there again! I love flying too:-) Would give my left arm to be able to count again this year!